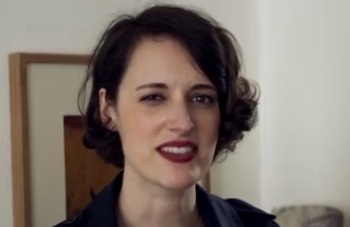 Amazon Prime Video has released a short promo for its upcoming original comedy drama series Fleabag, set to premiere this fall. Written by award-winning writer Phoebe Waller-Bridge and directed by Harry Bradbeer, the new TV show revolves around Fleabag (played by Phoebe herself), a dry-witted woman, as she deals with a breakup, the loss of her best friend, and financial troubles at her coffee shop. The “Why are you here?” trailer features Fleabag at a yoga class, answering to an old lady asking the women why they are there. “I want to shut the noise out and reconnect with my inner thoughts on the road to feeling more at-one with myself”, is her response, that makes the lady praise her “excellent attitude”. The latter reveals that “this weekend it’s about being mindful, it’s about leaving your voice in your head and trapping your thoughts in your scalp”. Fleabag, starring also Brett Gelman, Olivia Colman, Hugh Dennis, Jamie Demetriou, Bill Paterson, Hugh Skinner, Jenny Rainsford, and Sian Clifford, will be available for streaming starting with September 16.